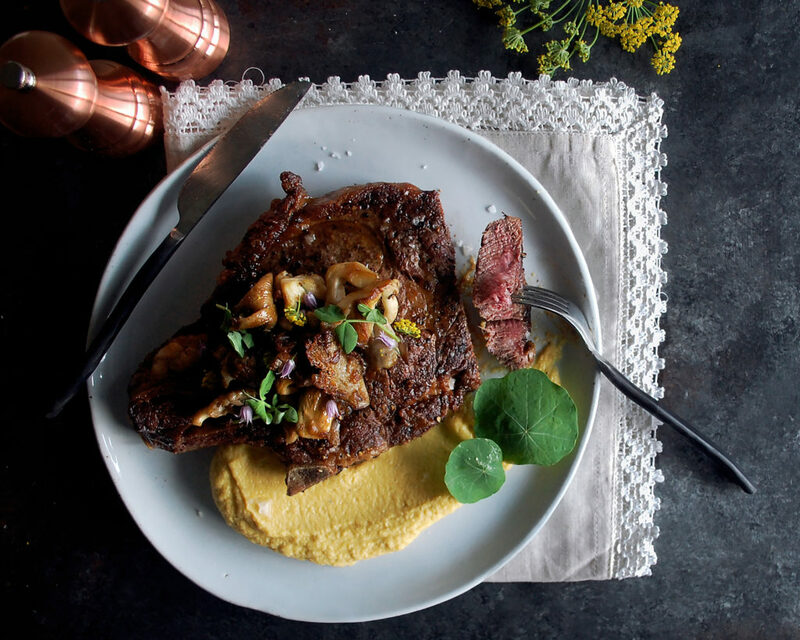 Your new go-to weeknight dinner: ribeye steaks with some really simple, exciting sides. A few posts back, you’ll find my best tips and tricks on how to sear the perfect steak. Once you have the steak down, it’s time to start thinking about what to serve with it. I love this dish because I’ve kept things so incredibly simple, yet it’s still exciting and something you can look forward to on a busy weeknight. The best part? It all can easily be done within 30 minutes. And, I use the same flavors throughout each component of the dish – garlic, fresh thyme, and butter. 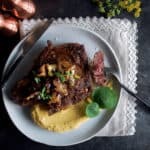 With just those three simple ingredients, the cauliflower puree and sautéed mushrooms turn into deeply flavored, delicious additions to the ribeye steaks. The trick with this dish is to season everything well. It’s obviously something you should always do while cooking, but here especially since everything consists of minimal ingredients. You need the salt to bring out the flavors of each item. So, I suggest tasting and adjusting the seasoning to your liking. I actually don’t usually write down salt or pepper amounts for my recipes because I think it should be adjusted according to everyone’s own taste. Anyways, season well and enjoy this wonderful dish on a weeknight or even for a more relaxing weekend meal! And be sure to check out the “how to” post on searing steak. 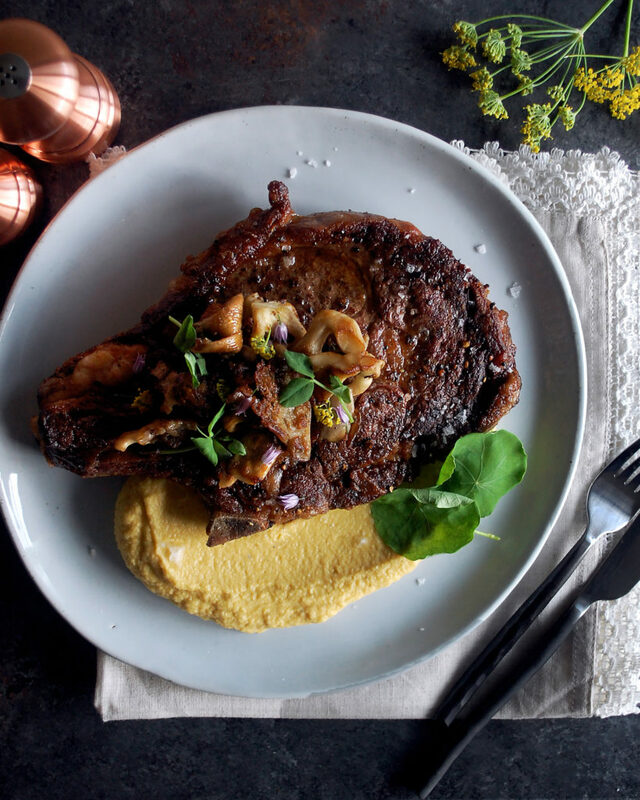 I go through the step-by-step process to achieve the perfect sear, and it’ll definitely get you in the mood for a caramelized, juicy steak. Enjoy! *You’ll need salt & freshly cracked black pepper throughout this recipe. Preheat the oven to 375F. Cut the cauliflower in half and core out the thick stem. Tear off any large leaves and discard. Break the cauliflower into smaller florets, all roughly the same size. Toss the cauliflower with olive oil in a large mixing bowl. Season with a pinch of salt. Spread the cauliflower onto a sheet pan and roast for about 35-40 minutes, or until tender and slightly caramelized. Heat the chicken stock and fresh thyme sprigs in a small saucepan over medium-low heat. Transfer the roasted cauliflower to a food processor. Run the food processor while slowly streaming in the hot stock. Start with half of the stock and continue to add until you reach a smooth consistency (you may not need to use all of the stock; you don’t want the puree to be runny). Add the butter one tablespoon at a time and let it blend into the puree. Season with salt to taste. Preheat the oven to 375F. Heat a large cast-iron skillet over medium heat (you may need to use 2 skillets depending on the size of your steaks). Add enough oil to coat the bottom of the pan. Season the steaks with salt and freshly cracked black pepper. When the oil is hot, add the steaks to the pan. Sear each steak for about 5 minutes until golden brown. Flip each steak over and transfer the skillet to the oven. Cook for 3 minutes. Return the skillet to the stovetop over low heat. Add the butter, crushed garlic cloves, and fresh thyme sprigs. Baste the steaks with the butter to finish cooking them to your desired doneness. While you’re working on the steaks, heat a large sauté pan over medium-high heat. Add enough oil to coat the bottom of the pan. When the oil is sizzling hot, add the mushrooms and fresh thyme sprigs. Let the mushrooms brown and caramelize, about 5 minutes. Lower the heat and season the mushrooms with salt and freshly cracked black pepper. Add the butter and let melt. Toss the mushrooms in the butter. Keep warm until serving. 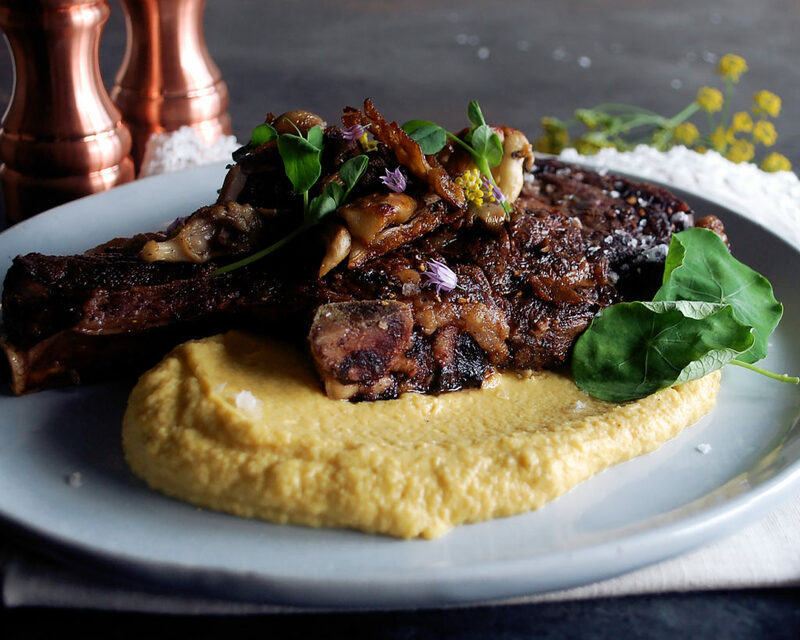 Serve the cauliflower puree alongside the seared steaks. Spoon the mushrooms over the steak. Garnish with the chive blossoms (or chives, if you can’t find them) and pea shoots.